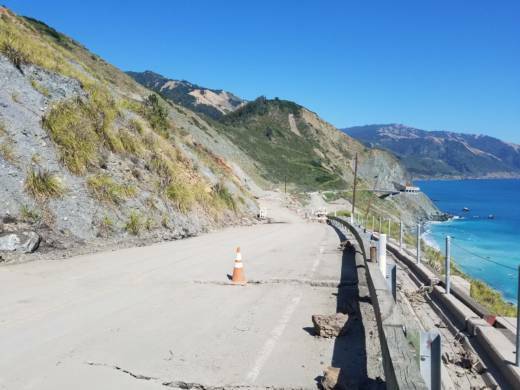 Transportation officials have targeted July for reopening an iconic stretch of Highway 1 in the scenic Big Sur coastal region that was blocked last year by a massive landslide. The road that connects Los Angeles to San Francisco was projected to open in mid-September, but the California Department of Transportation announced Tuesday it will open to all travelers by the end of July. "Rebuilding Highway 1 and restoring traffic along the Big Sur coast has been our priority. And by opening the highway sooner than expected, it will boost the many Central Coast communities affected by this major landslide," said Richard Rosales, an acting district director. Highway 1 has been dogged by slides since December 2016, but the one that hit in May 2017 was monumental. Millions of tons of earth moved, displacing 75 acres (30 hectares) of land. The work is being done about 25 miles (40 kilometers) south of where another segment of the highway was blocked when a storm-spawned landslide wrecked a bridge in early 2017.